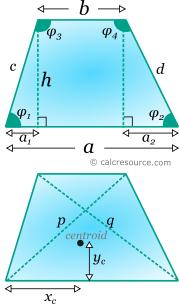 This tool calculates the basic geometric properties of a trapezoid. Enter below the shape dimensions. 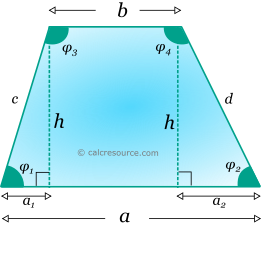 It is not required for base α to be the bigger one. The calculated results will have the same units as your input. Please use consistent units for any input. where a, b the lengths of the two bases and h the height. 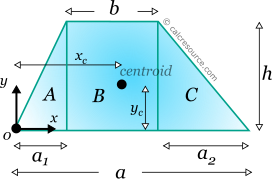 The centroid coordinates in respect to the bottom base left vertex, xc and yc (see figure below) can be calculated using the first moments of area, of the three sub-areas A,B,C. 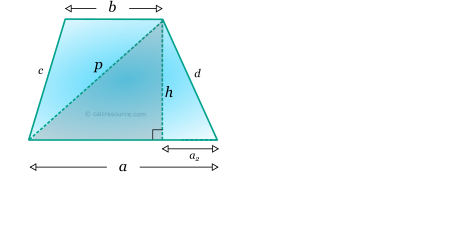 The above formulas are valid even when α1 or α2 are negative, which occurs when the angles φ1 or φ2 , are obtuse.